The Texas A&M College of Veterinary Medicine & Biomedical Sciences hopes to inspire the next generation of veterinarians during a day of activities and tours. Vet School Open House 2018. Animal lovers of all ages can experience in a single day a year’s worth of the activities shared by students in the Texas A&M University College of Veterinary Medicine & Biomedical Sciences (CVM) during the 26th annual Vet School Open House on March 30. Coordinated by hundreds of veterinary students and undergraduates, the event opens the doors to the Veterinary & Biomedical Education Center (VBEC), the Large Animal Hospital, and the Small Animal Hospital for a day of fun-filled activities, from 9 a.m. to 4 p.m.
“I distinctly remember attending my first Vet School Open House as a junior in high school, and truthfully, I believe it played a large role in guiding me to where I am today,” said Hunter Enderle, Open House co-director and third-year veterinary student. “After attending that Open House, I knew this was the school I wanted to attend and that veterinary medicine was the career that I would pursue. 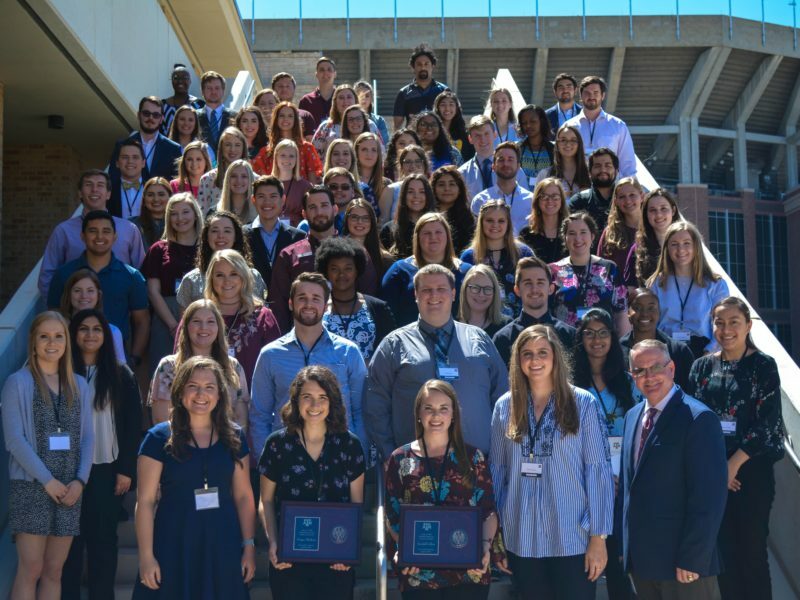 “I’m so excited to be a part of an event that has such a meaningful impact; I’m glad I can help continue this tradition and inspire future Aggie veterinarians like myself,” he said. Attendees have the opportunity to tour the Small and Large Animal Hospitals, explore many different exhibits from rescues and other organizations, and watch talent demonstrations by animal groups. Other popular activities include a teddy bear “surgery,” where children can learn about suturing; the dog kissing booth; the petting zoo; and the Exotics Room, which features dozens of reptiles. Food trucks will also be on-site. In addition, Texas A&M students coordinate with area schools to create exhibitions of student artwork by children from elementary and middle schools across the country. “Being a part of Open House has been one of the highlights of my time in veterinary school, and I am so proud of all of the students who have spent countless hours preparing for this event,” said Victoria Grimsley, Open House co-director and third-year veterinary student. “Open House has something to offer for everyone; there are countless opportunities for fun, while also learning about what makes veterinary medicine so great. “I hope that by hosting this event each year, we are able to inspire the next generation of veterinarians and further strengthen the human-animal bond,” she said. All activities are free to the public, and families with children of all ages are welcome. While registration is not required, those interested in touring the Small Animal Hospital are encouraged to pre-register by emailing OHSAHCoordinators@cvm.tamu.edu with a name, the number of adults/children in the group, and what time the group would like to tour. Although the event began over two decades ago, the heart behind the open house remains the same. Vet School Open House started in 1993 as a small showcase of the college’s facilities with a petting zoo. The event is much larger now, but it still gives the public a chance to get a behind-the-scenes look at one of the country’s premiere veterinary schools, all while learning about all the opportunities and best practices in the field of veterinary medicine. For more information about the event, including frequently asked questions, and updates, visit vetmed.tamu.edu/openhouse, or follow the event on Facebook, Instagram, and Twitter for more updates and announcements. Media contact: Megan Palsa, Texas A&M College of Veterinary Medicine & Biomedical Science, mpalsa@cvm.tamu.edu.